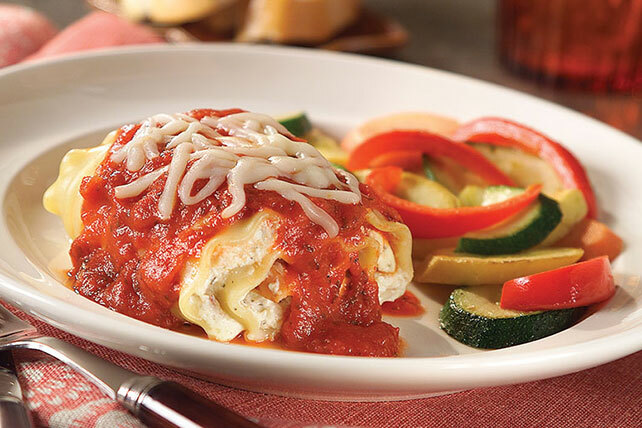 Enjoy the cheesy goodness of lasagna in these Chicken Lasagna Roll-Ups! Prep time for this Chicken Lasagna Roll-Ups recipe is just 20 minutes. Combine first 5 ingredients; spread onto noodles. Roll up tightly. Place, seam-sides down, in 9-inch square baking dish. Cover with sauce; top with mozzarella. Substitute BREAKSTONE'S or KNUDSEN Cottage Cheese for the ricotta.